Observation - lone leaf - UK and Ireland. Description: leaf 8.5 cm, stem 7 cm, 11 cm at widest; found on woodland floor- Minepit Wood, near East Grinstead; no others nearby. 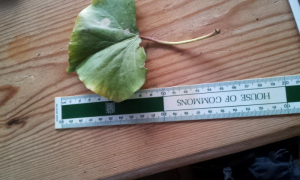 leaf 8.5 cm, stem 7 cm, 11 cm at widest; found on woodland floor- Minepit Wood, near East Grinstead; no others nearby.